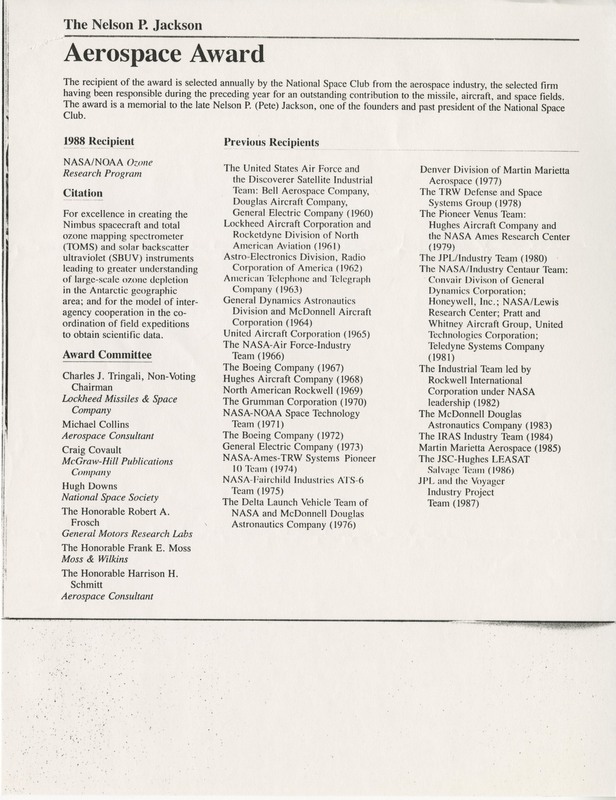 Subject is exactly "Project Gemini (U.S.)"
Page from a publication with information on the 1988 Nelson P. Jackson Aerospace Award and its past recipients. 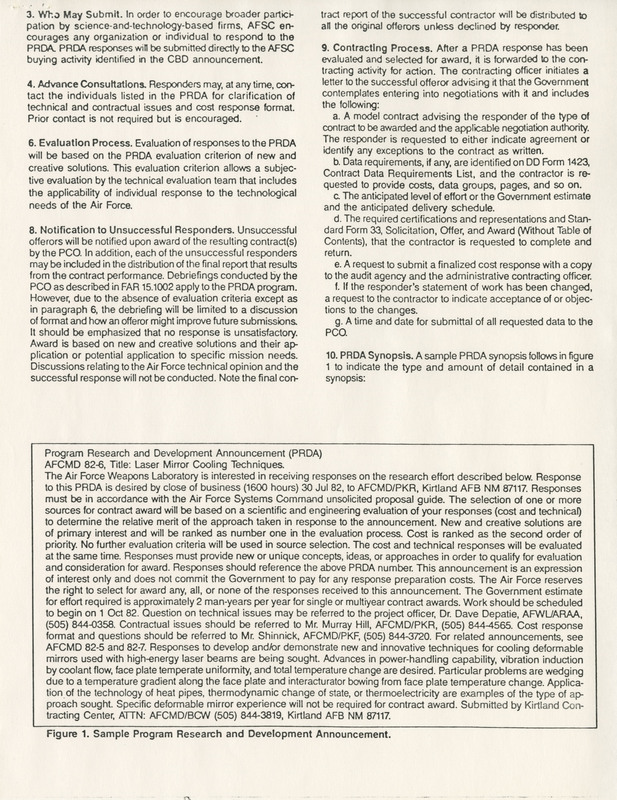 Page listing the rules for a PRDA related submission process. 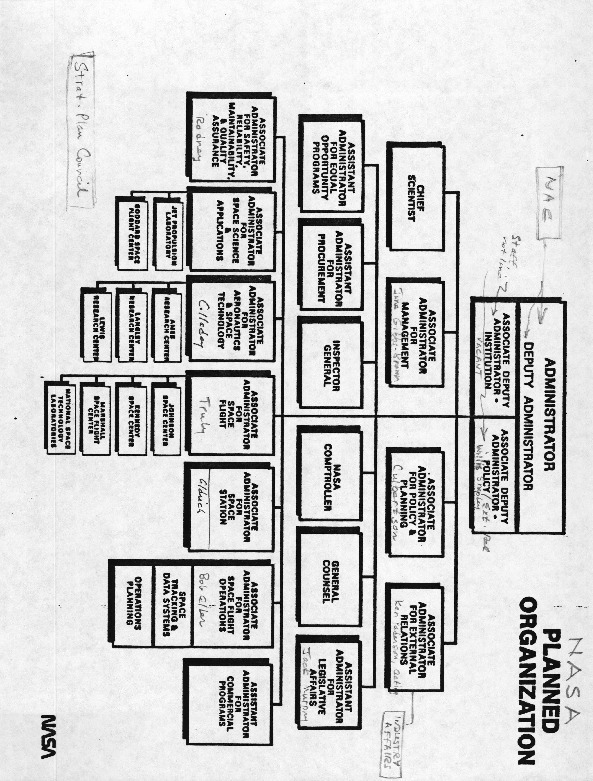 Management Model for "Human Factors Engineering in Research, Development and Acquisitions". 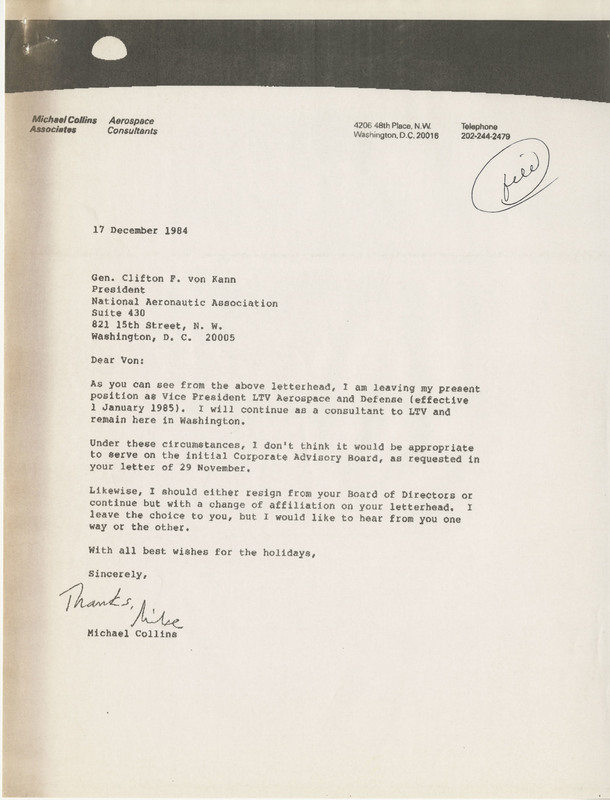 From the Department of the Army. 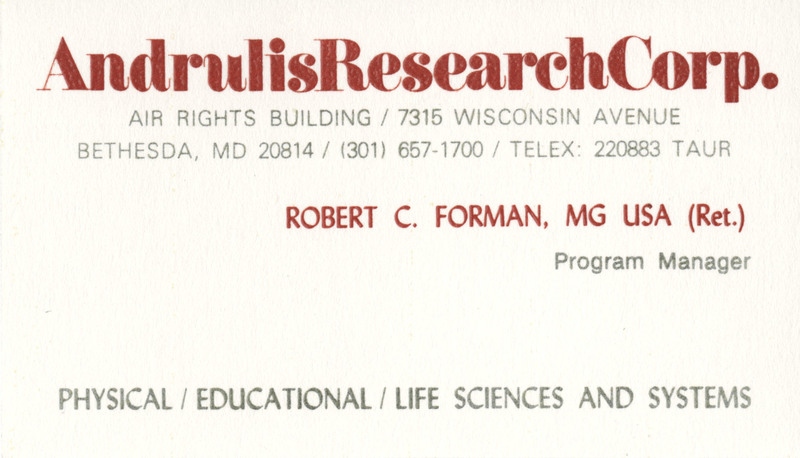 Business Card for Robert C. Forman, Program Manager, from Andrulis Research Corp in Bethesda, MD. 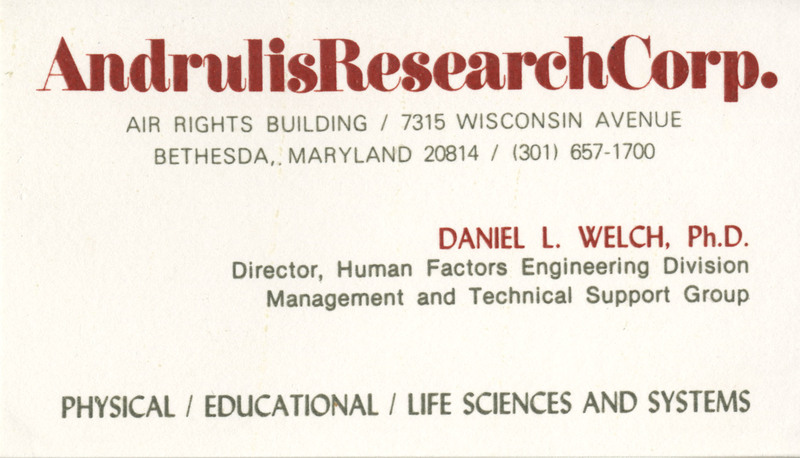 Business Card for Daniel L. Welch, Ph.D., Director (Human Factors Engineering Division), from Andrulis Research Corp in Bethesda, MD. 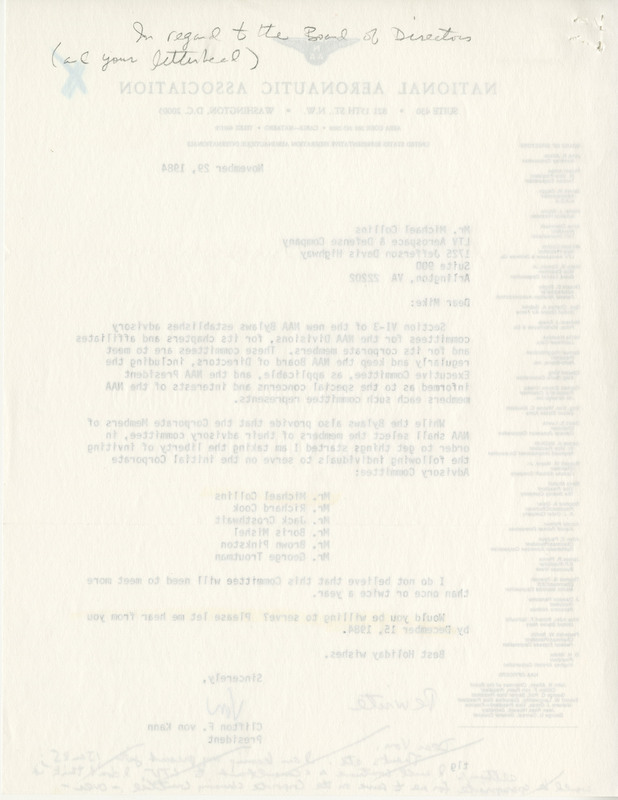 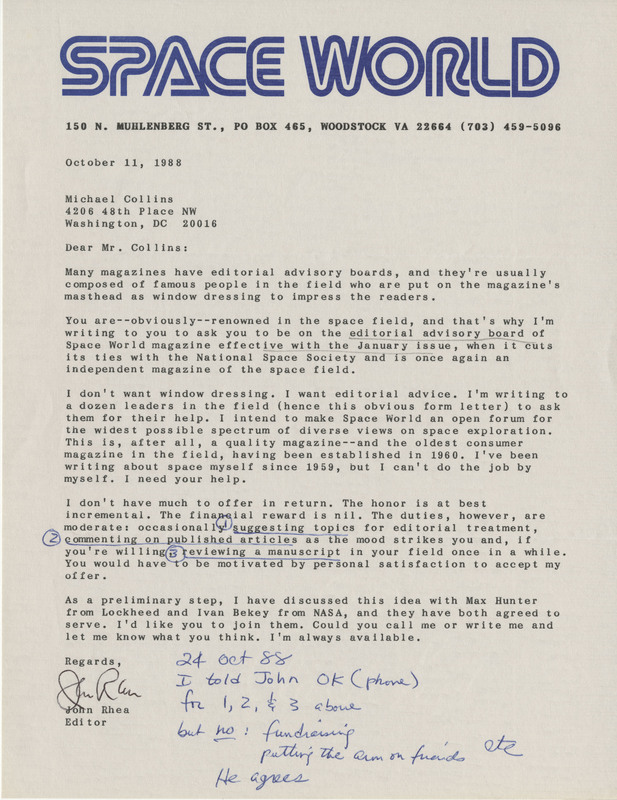 Letter from Space World Editor John Rhea to Michael Collins, offering Collins a position on the Space World editorial advisory board. 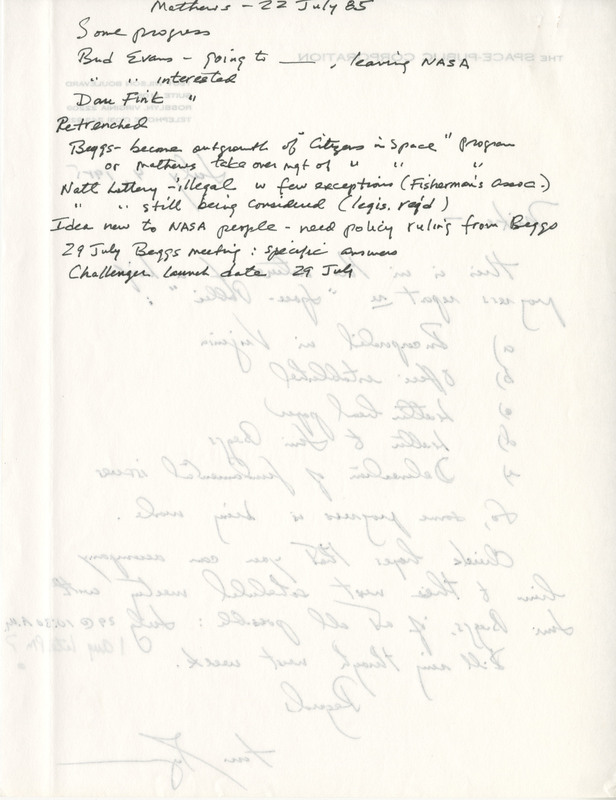 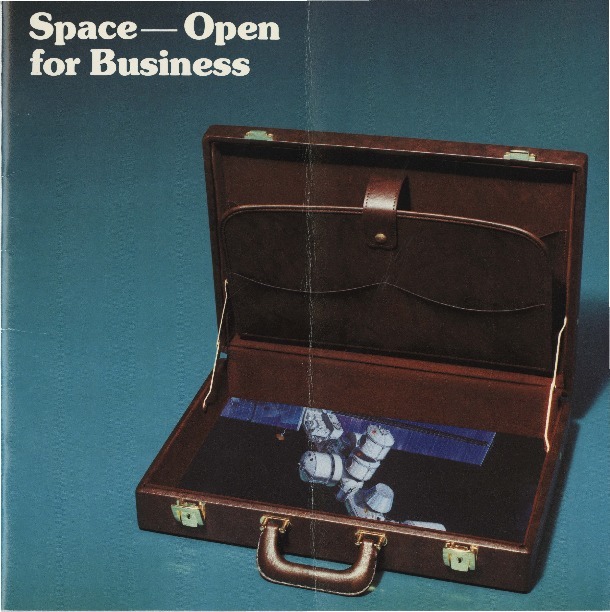 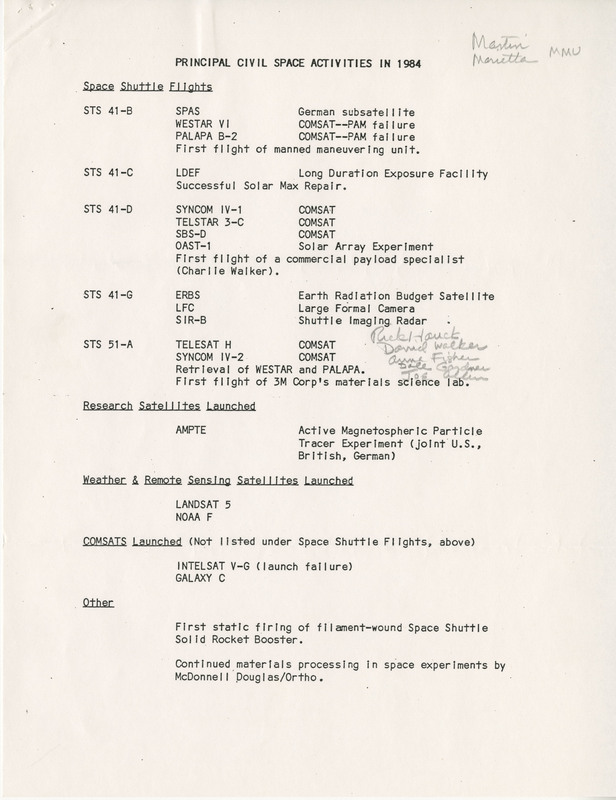 Notes written on a file folder regarding the Space-Public program to allow "ordinary people in space". 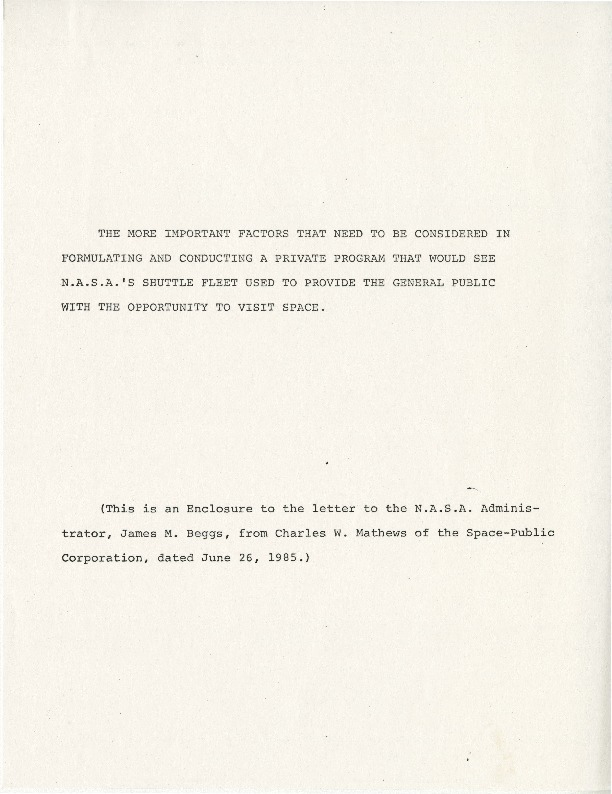 Various handwritten notes on the proposal to open spaceflight up to the public. 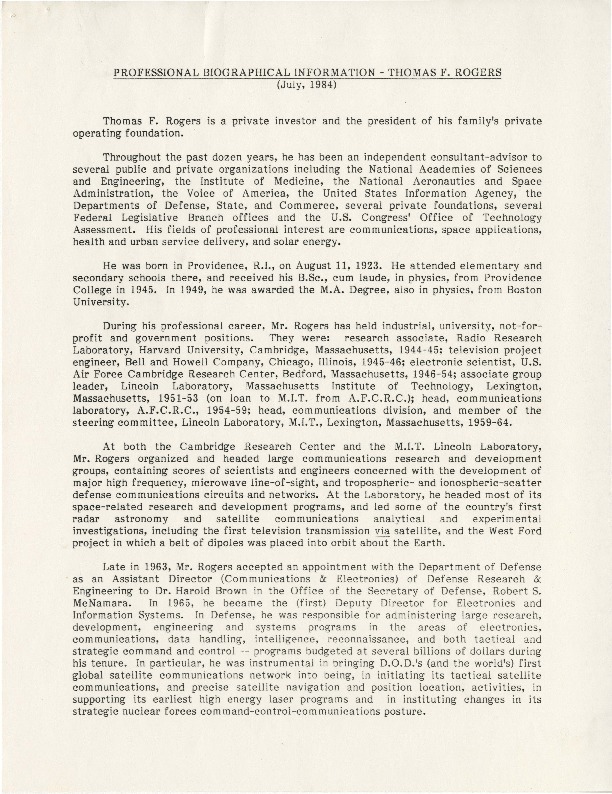 Draft of a Memorandum of Understanding Between the National Aeronautics and Space Administration (NASA) and the Space-Public Corporation. 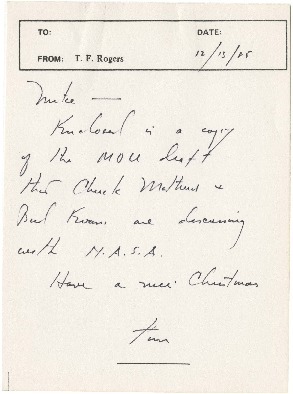 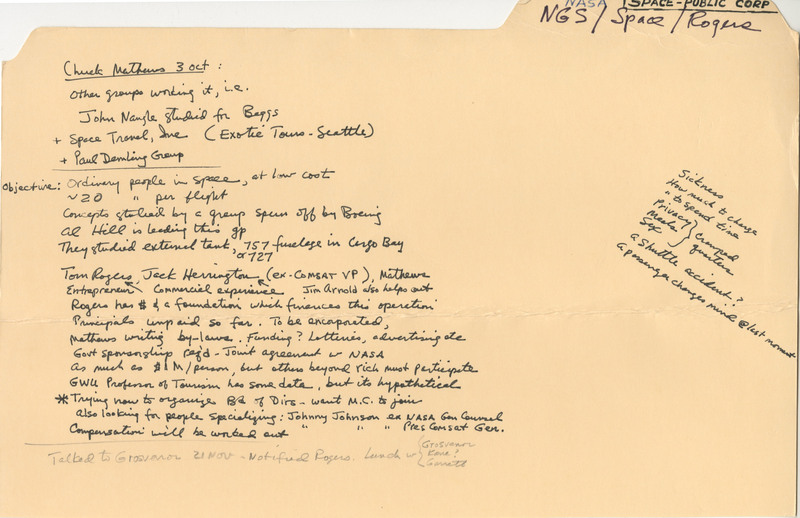 Handwritten letter from T. F. Rogers to Michael Collins providing a "brief progress report" regarding Space-Public. 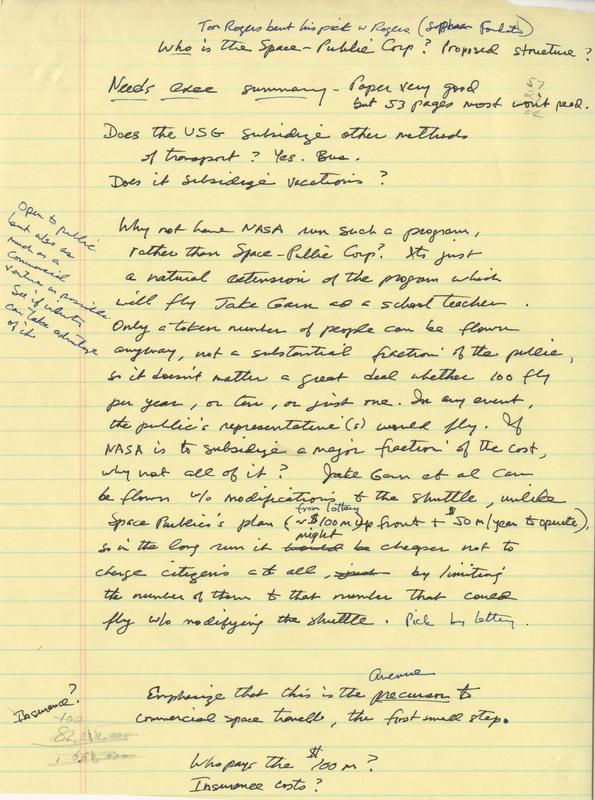 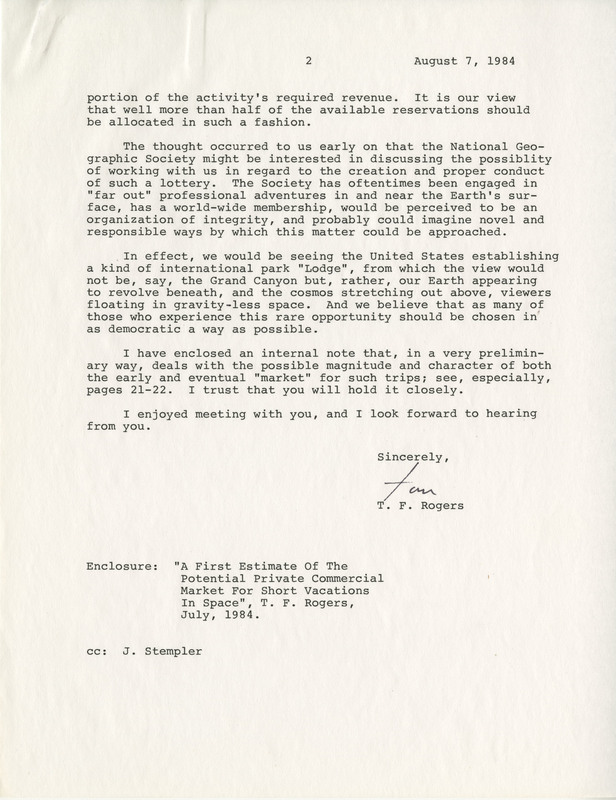 Letter from T. F. Rogers to Michael Collins following up on their recent meeting and offering the idea of a National Park Space Lodge. 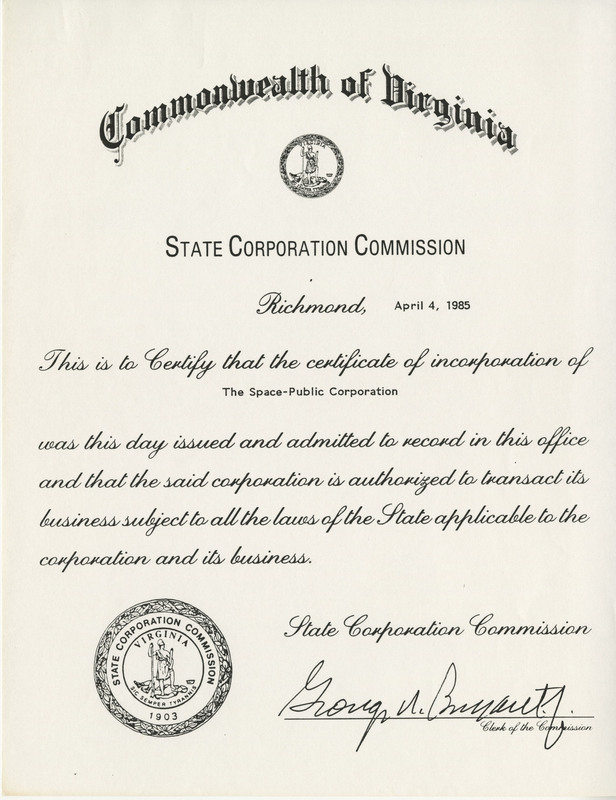 Certificate from the State Corporation Commission of Virginia certifying the incorporation of the Space-Public Corporation on April 4, 1985. 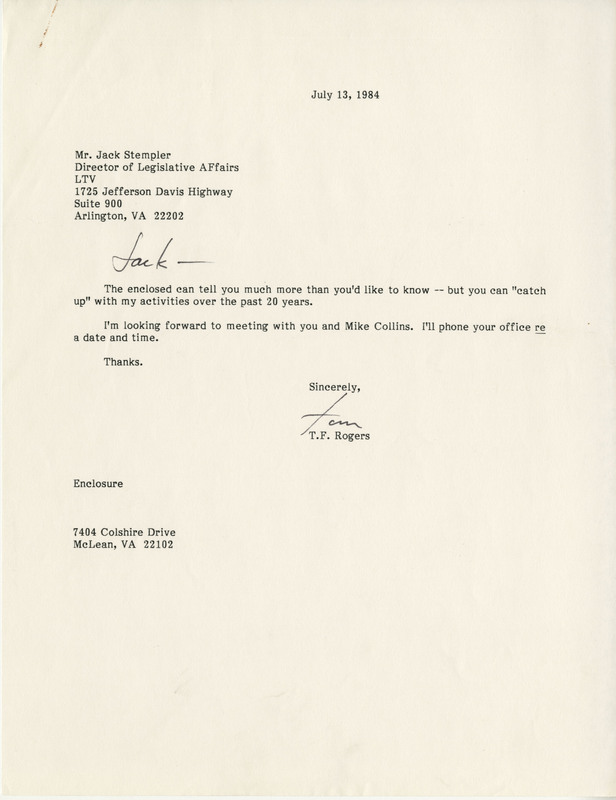 Letter from Pat. 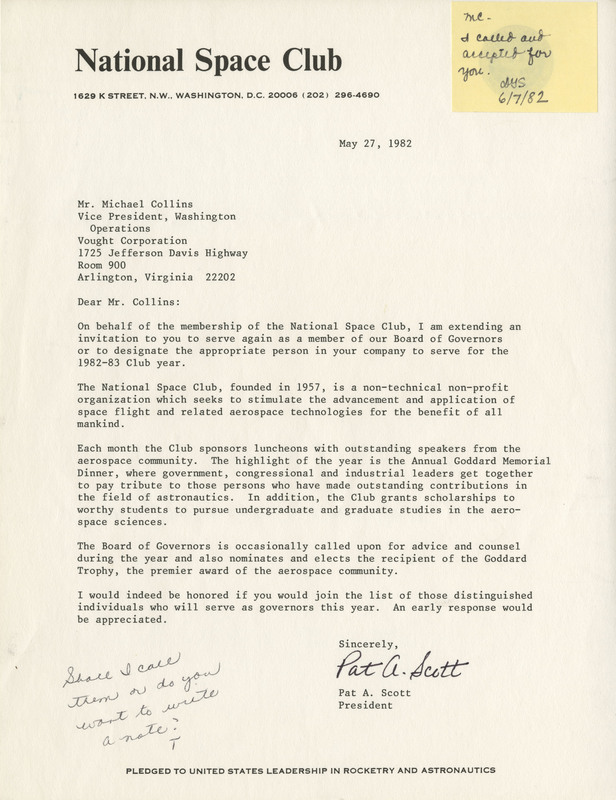 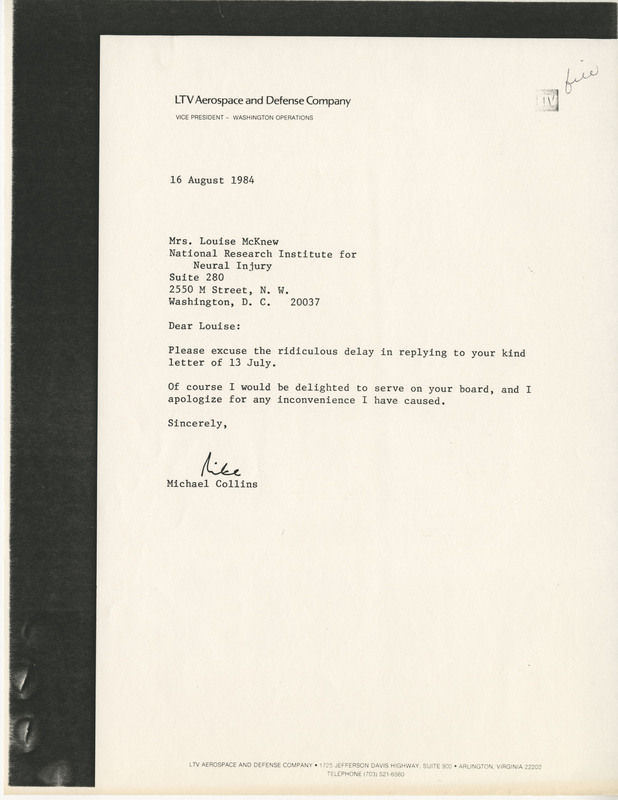 A Scott (President of the National Space Club) to Michael Collins inviting him to their Board of Governors. 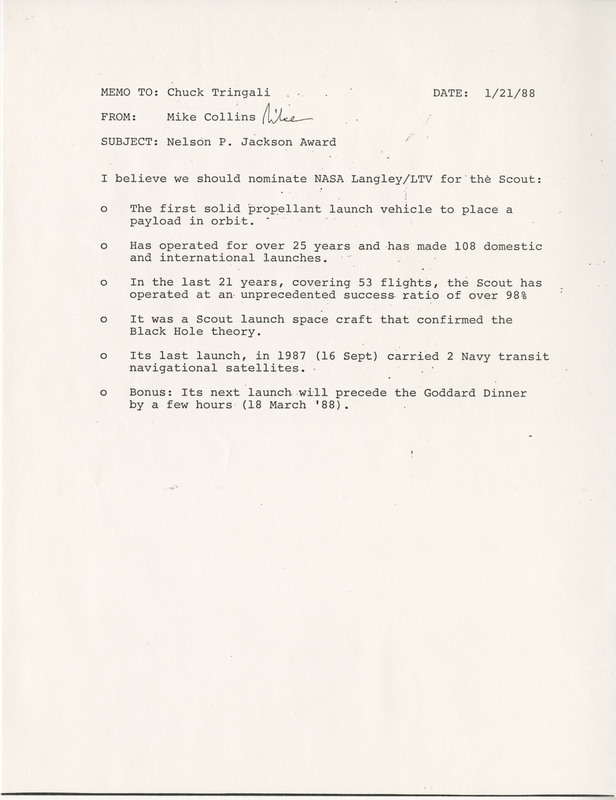 Memo from Michael Collins to Chuck Tringali regarding the Nelson P. Jackson Award and nominating NASA Langley/LTV for the Scout (Rocket). 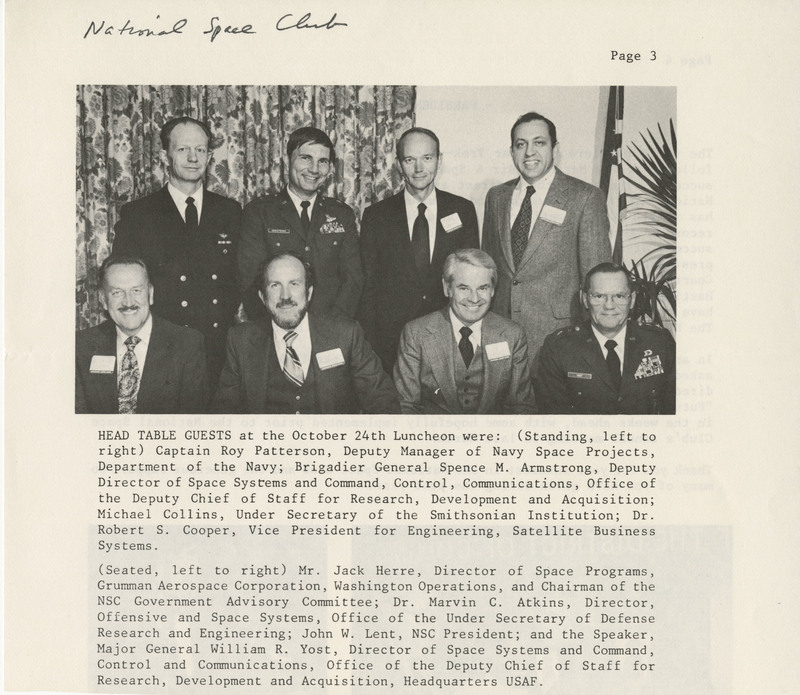 Clippings from an unknown publication regarding the National Space Club with attendence information for a October 24th luncheon. 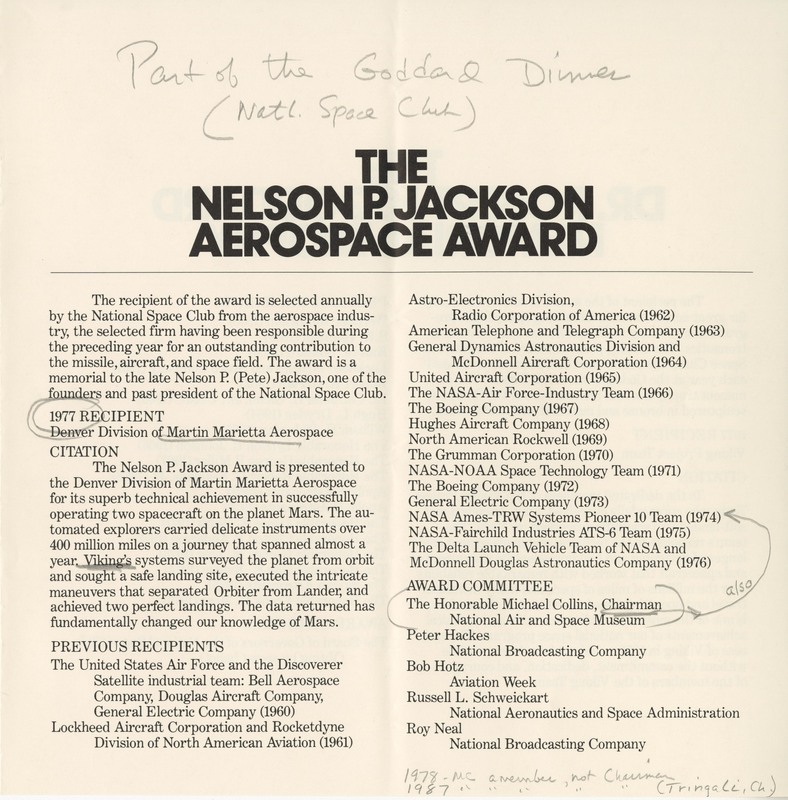 Informational booklet for the 26th Annual Goddard Memorial Dinner on March 25, 1983. 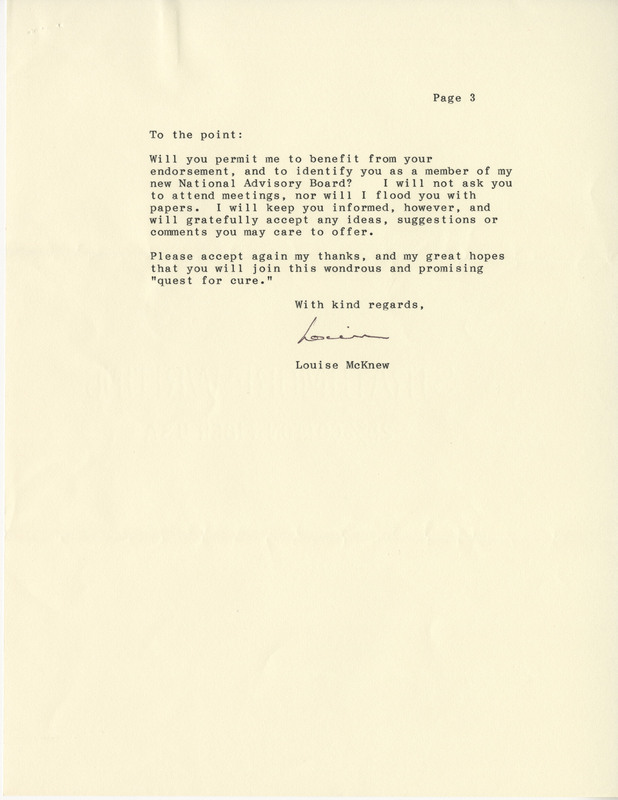 Letter from Michael Collins to Louise McKnew (National Research Institute for Neural Injury) accepting (after a delay) to serve on the board. 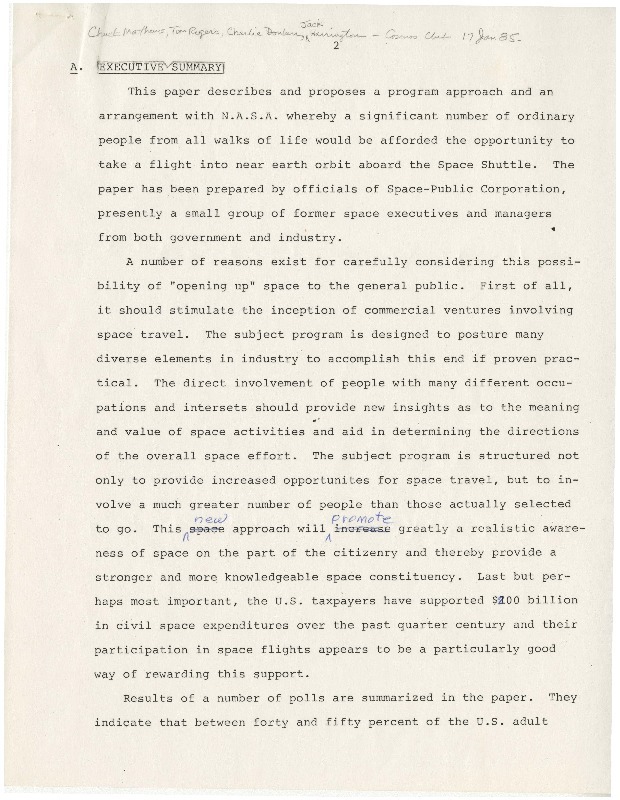 Part 2 of 2 of various notes from the NASA Goals Task Force. 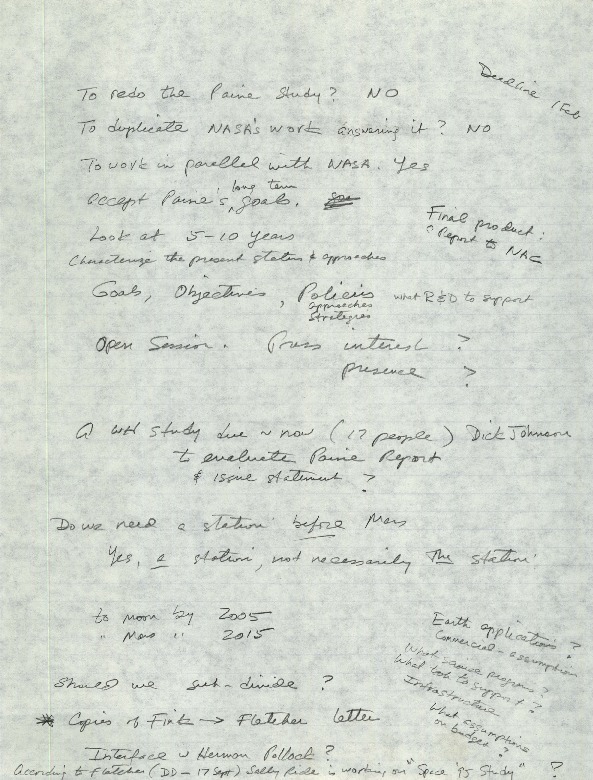 Part 1 of 2 of various notes from the NASA Goals Task Force. 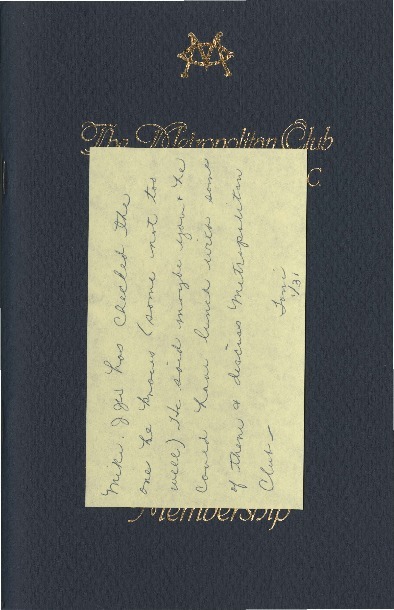 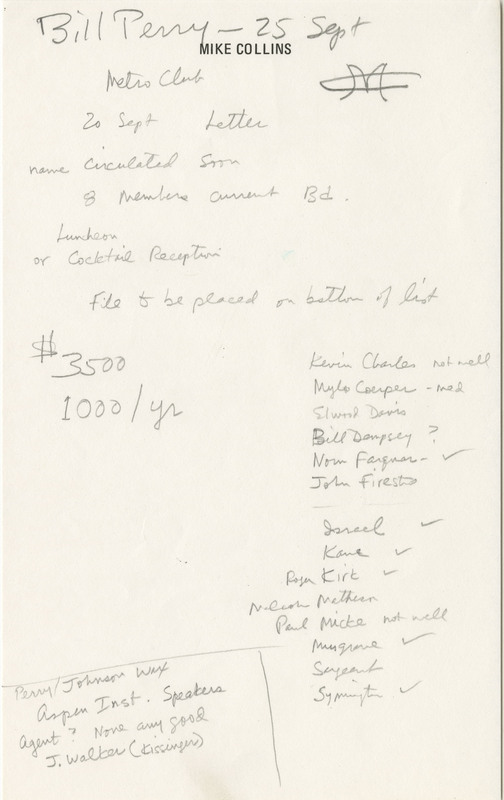 Note consisting of various names and dates related to the Metropolitan Club. 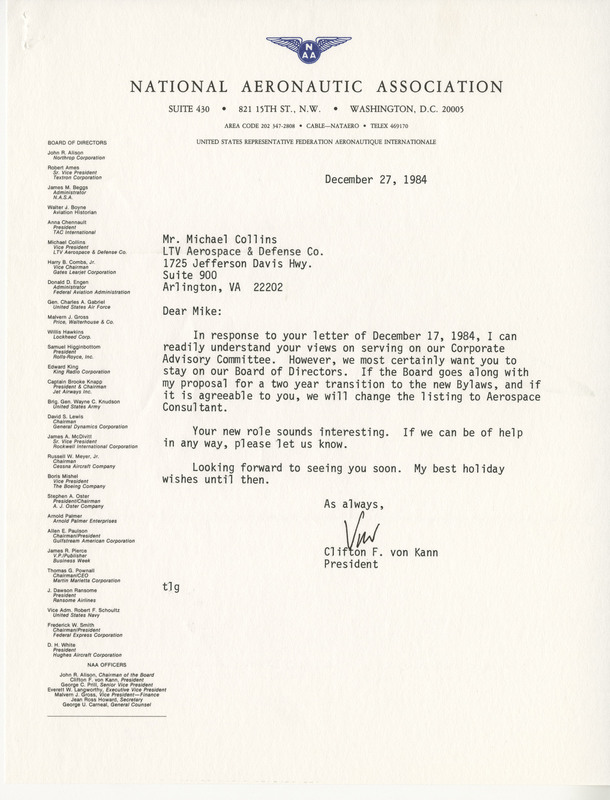 Proposal of Michael Collins for Resident Membership of the Metropolitan Club of Washington, D.C. 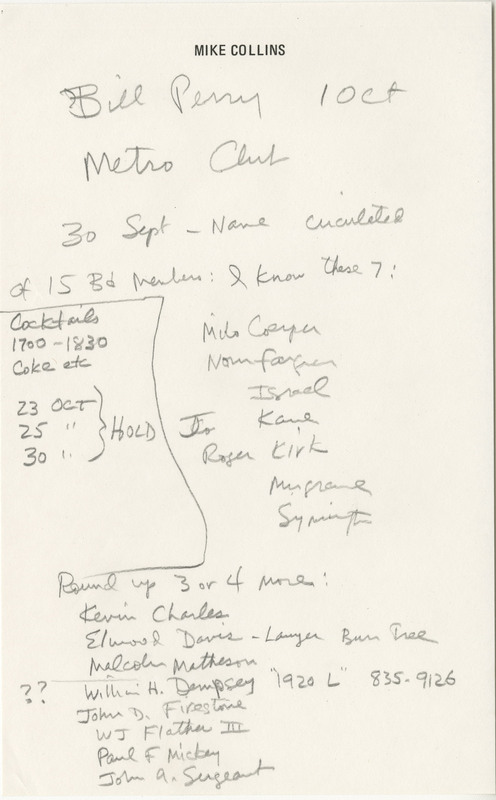 Note consisting of various names and dates related to the Metropolitan Club. 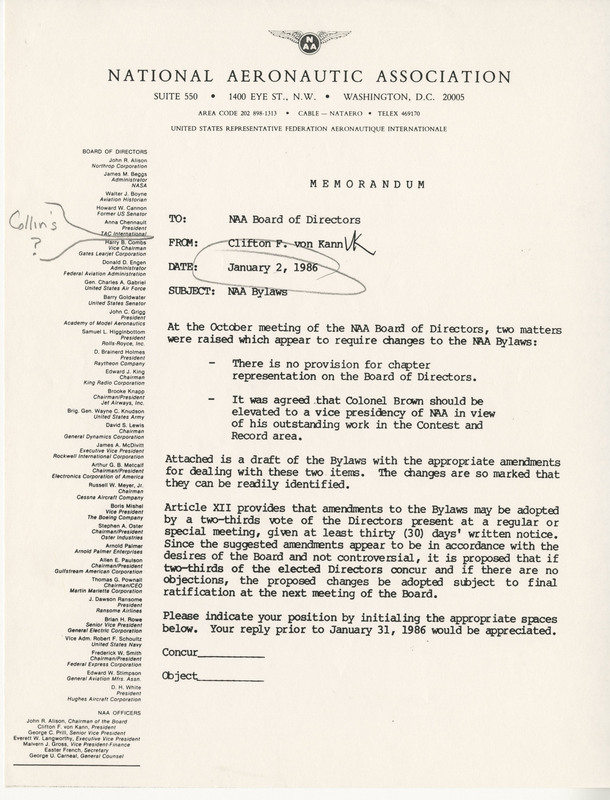 Many names are crossed out. 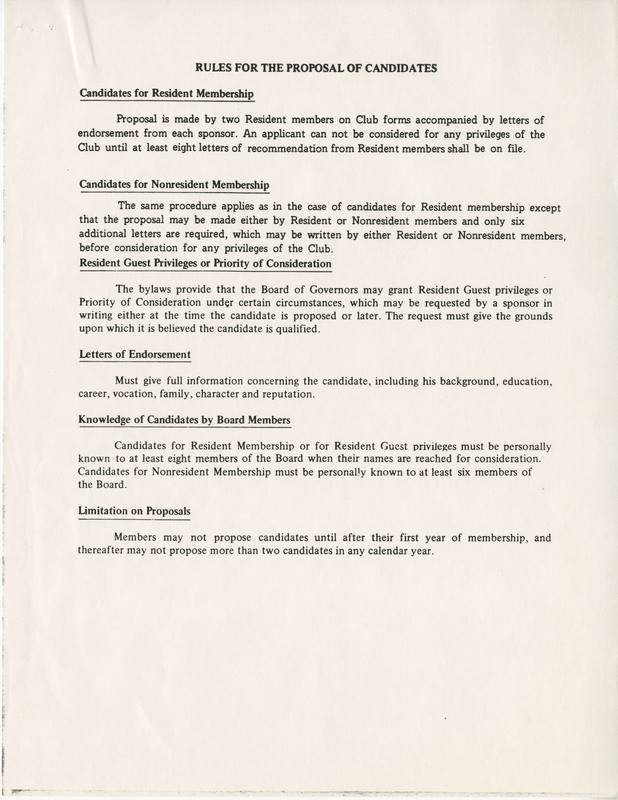 Pamphlet from the Metropolitan Club detailing the services offered by the club. 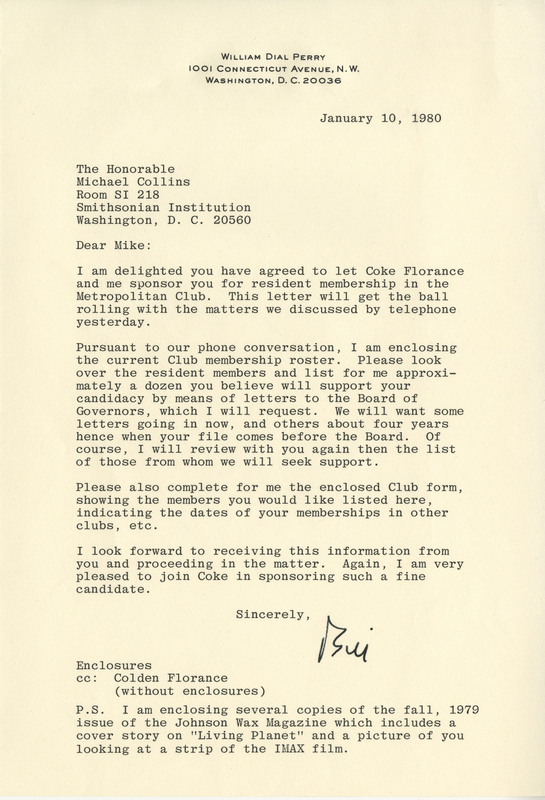 Letter from Metropolitan Club House Committee Chairman John D. H. Kane to Member explaining the Club benefit of Private Entertaining. 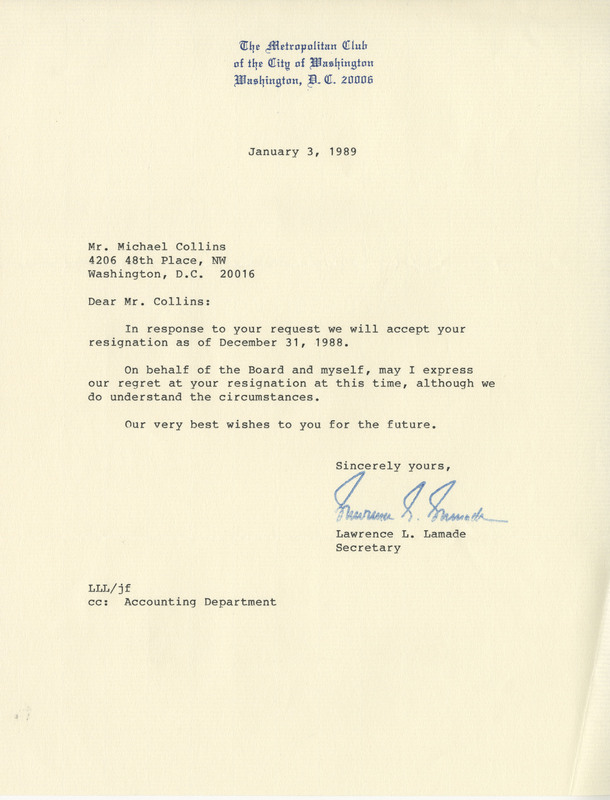 Letter from Metropolitan Club Secretary Lawrence L. Lamade accepting Collins' resignation. 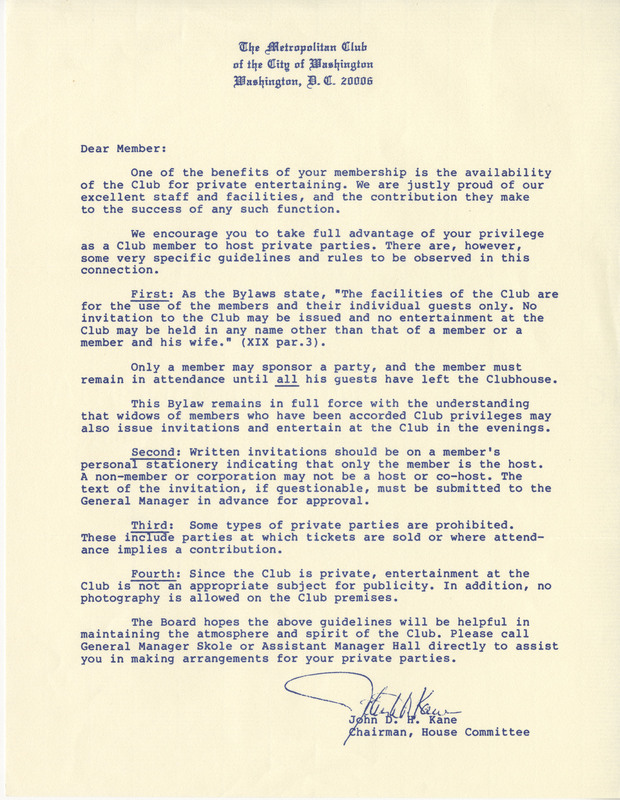 Letter from Metropolitan Club Secretary Roger Kinte to the Members of the Club giving information on sponsoring new members. 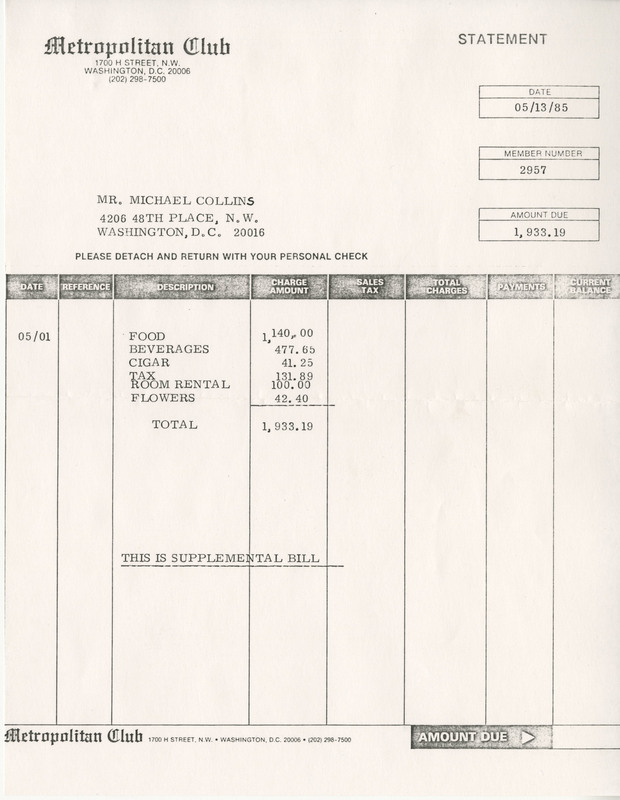 Supplimental Bill for Michael Collins expenses from the Metropolitan Club. 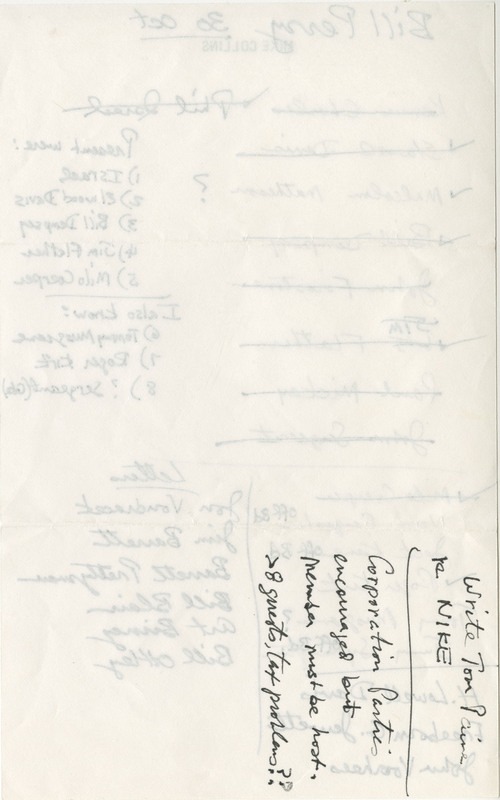 Total due $1933.19. 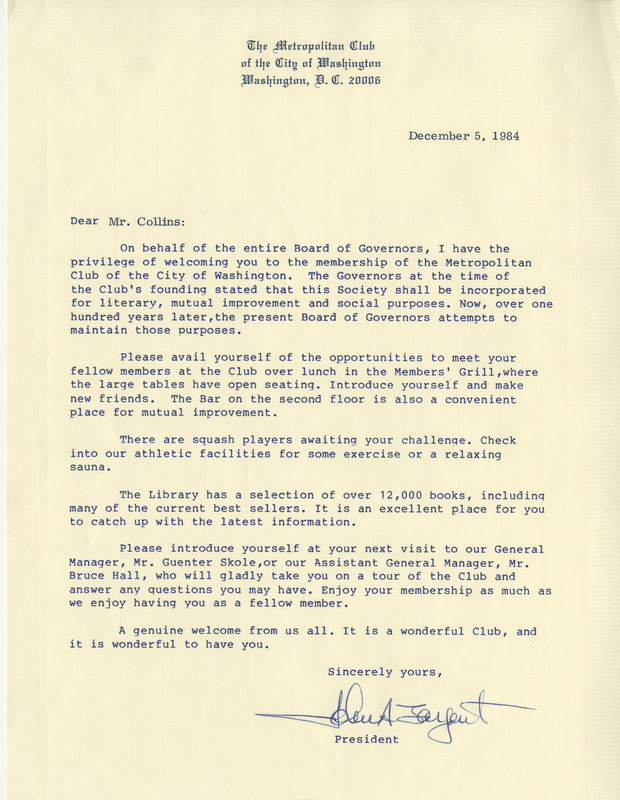 Letter from the Metropolitan Club President John A. Sargent to Michael Collins welcoming him to the MC. 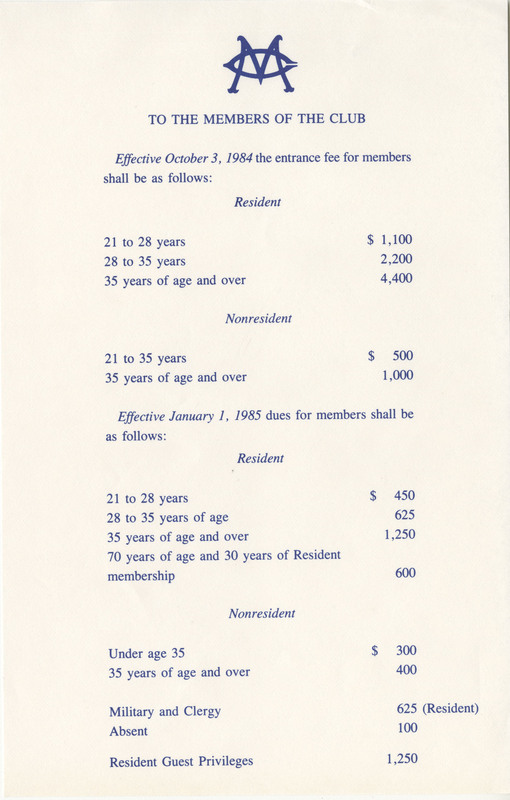 Announcement to the members of the Metropolitan Club detailing the entrance fees effective October 3, 1984. 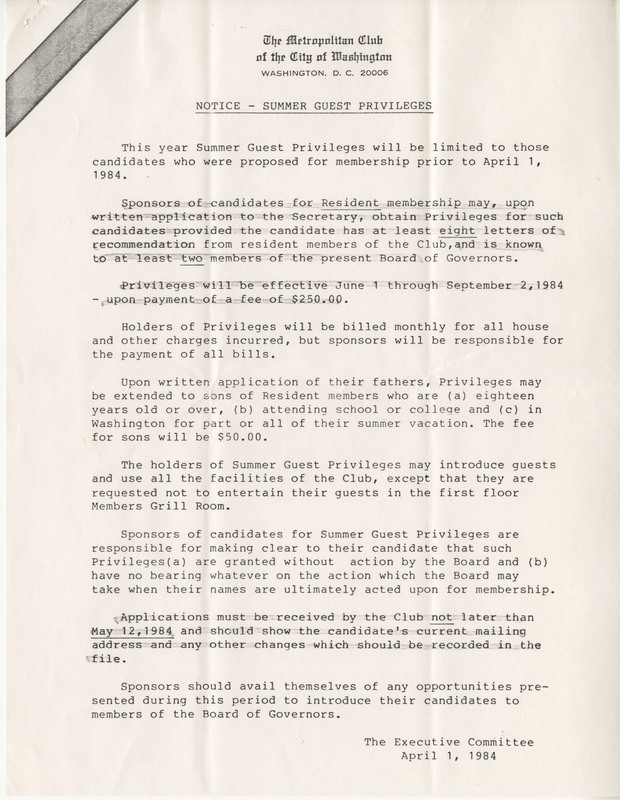 Letter from William D. Perry to the Secretary of the Metropolitan Club requesting Summer Guest Privileges for Michael Collins. 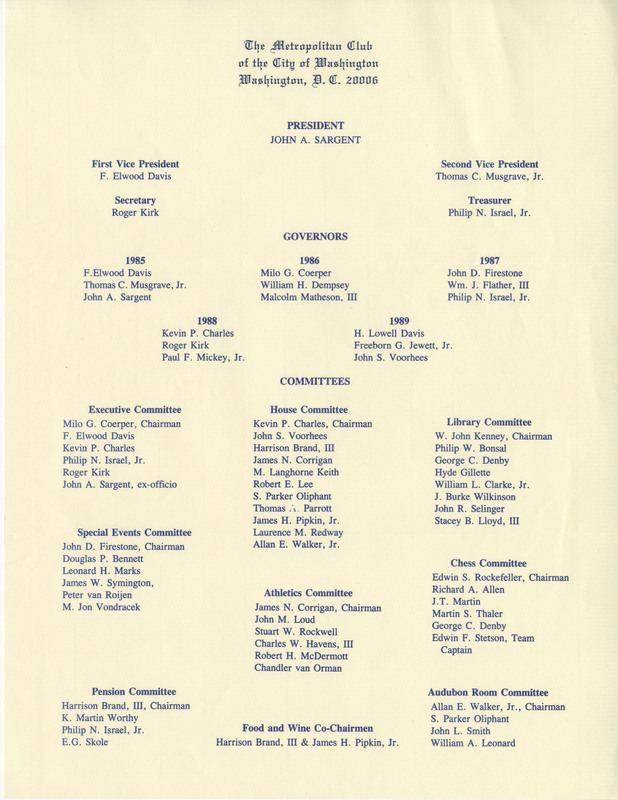 Booklet listing the full membership of The Metropolitan Club of the City of Washington, D.C. for January 1985. 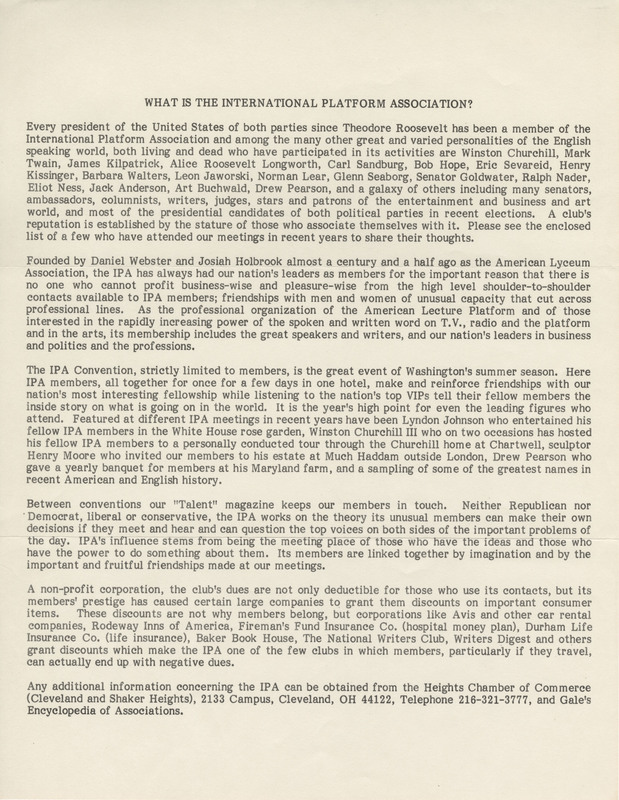 Broadside titled "What is the International Platform Association?". 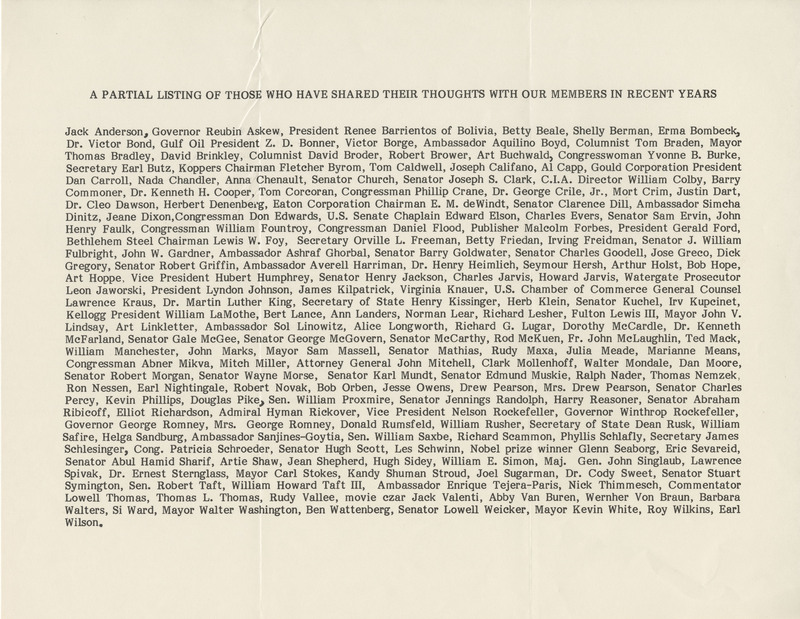 Broadside Publication titled "A Partial Listing of Those Who Have Shared Their Thoughts With Our Members in Recent Years". 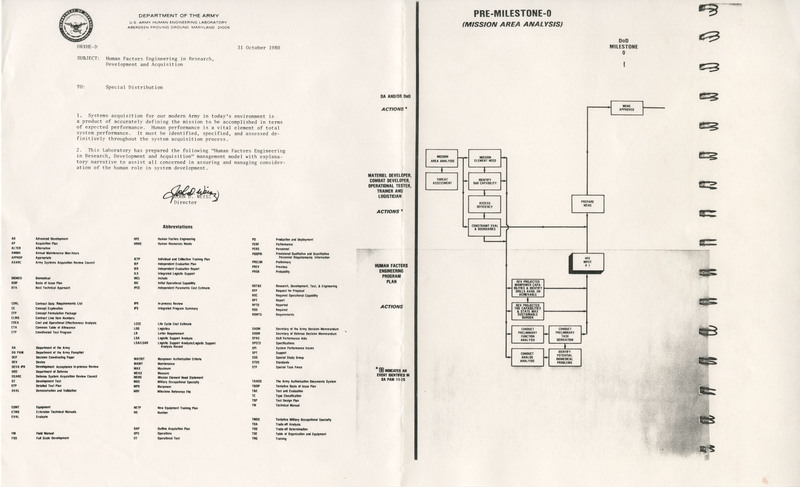 Informational Pamphlet on the International Platform Association. 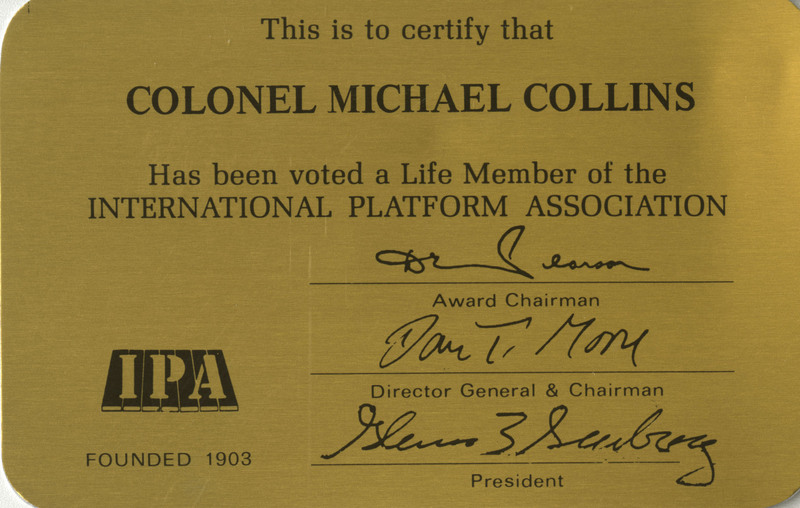 Metal Certificate from the International Platform Association certifying Michael Collins' being voted a Life Member of the IPA.